Instagram and Pinterest are the most famous visual social media platforms but which one is the best for your company and how to build a strong community on each of them? The principle of Instagram is to publish your pictures with a beautiful filter, making any photo wonderful. People can follow you and like your pics. You can also publish videos, stories like on snapchat and, since recently, even create diaporamas. You can’t share pictures you like (without another app) but you are welcome to comment and follow a lot of users. It is the perfect social media for photography lovers and is very useful to increase attractivity of a territory (tourism) as well as business with an aesthetic side. The typical profile of the Instagram user is a young person (2/3 of users are between 18 and 34 years old), from anywhere in the world (even if Europe is a good client), wanting more personal relationships with brands. For a brand, to be present on Instagram means wanting to create engagement and conversation with an audience. Indeed, as I use to say, pictures are emotional and sharing your own photos gives a piece of your spirit and values to your fans. The particularity of Instagram vs. Pinterest is that you share your own content on Instagram whereas it’s mostly other’s on Pinterest. That’s why, on Instagram, you may share some company’s private moment like an exclusivity to your fans. It can be backstage, internal events, shootings, launch preparation, everyday life in the office and why not co-workers’s birthdays… People who are following you want to have a personal and personalised relationship with your brand. They want to feel like they’re very important to you, like there’re considered. It is a good mean to increase your fame and build your brand image too. By sharing beautiful pictures, you can link your fans’ emotions to your brand. The more they see positive side of your company and its life/products, the more they’re keen on liking the brand, the more they feel close to it and the more you can retain customers and transform them into ambassadors. Sometimes, people don’t need to buy products to be faithful to a brand. Apart from the photo filter system, which helps you getting easily beautiful pictures, Instagram allows you to add lots of hashtags in your photo description. Those are sufficiently used by instagramers to find new pics or new accounts to follow. But less is more, so to be relevant, refrain yourself to 10 hashtags maximum. Hashtags will help you getting more followers and more visibility, so consequently more fame. It will help you spread your branding essence over the web. But what’s best with Instagram is to enter your fans everyday life. Most of Instagram users browse on their spare time around 6 or 7 pm. It’s the perfect moment to get into their daily routine and reach their mind. Formerly, brands used to give gift with their logo to their clients to make sure they will remember them, a bit, everyday. Now every day, with Instagram, you can remind how wonderful is your brand with a well chosen picture. Let’s change side with Pinterest. The system is different. The platform is organised around thematic boards where you « pin » content you find interesting. Content is mostly constituted with photos but it can be articles too. One big difference with Instagram is you can (and should) share content from others. Of course, you can share your own photos, your own products, your own blog articles but you won’t be taken seriously if you only share your own content. Pinterest is social by essence and you have to share, repin and comment other users to be part of the community. The most important word related to Pinterest is INSPIRATION. As I said earlier, the most important objective to follow on Pinterest is to give inspiration. The way the network is built is perfect to help people find ideas for anything but particularly fashion, cooking and DIY. And as a consequence is a real source of content for your company innovation and inspiration. It helps you find new trends, evaluate reactions, do your benchmark… It also inspires you/your employees as well as you can inspire your followers. As a result, this social media is a way to help people learn more about your business, your area and expertise. You can teach people how to do things, how to do better (in your field of competence), show them possibilities, things they didn’t think of. You can get credit for it and strengthen your brand image. You establish your expertise and prove it every day. You can show what’s you’re the best at. Last objective : to increase traffic to your website/blog. Indeed, Instagram only permit a link on your profile description while Pinterest links all content to its source. As you pin some of your products photos, you easily get your followers to your website or blog. It is a great advantage if you’re looking for a visual platform to meet your commercial objectives. But it shouldn’t be your only motivation to get on Pinterest. Pinterest is great to build a faithful community, linked to your brand by your expertise and relevant contributions. It is focused on sharing : you can pin content from anywhere on the web from the moment it fits your thematic. It is a way to do visual curation so you get inspired. Hashtags are used on it but you are advised not to use too many hashtags. Moreover, Pinterest is better for storytelling by choosing the right board thematic and arranging it to tell a story and of course, your brand story. You can share any photos and visual content like infographics or drawings… Each board you create can feed the myth you want to build (or share if you are totally convinced by your story :D) around your brand. Use apps linked to your Instagram account to sell products in real time but do it with moderation. Here are some of them : Like2Buy, Soldsie or LIKEtoKNOW. Now, it’s time to see practical examples. Some brands are doing so well on social media, we have to learn from them. So I’ll introduce you to 2 great examples of Instagram and Pinterest accounts or campaigns. I selected one example among numerous actions. This is an engaging campaign that I chose to introduce. In May 2015, Ibis Styles decided to make people win some decoration objects standing in its hotels, created by famous designers. To do so, Ibis Styles indicated products prices in Instagram likes. For example, to get a lamp, you need 70 likes or this armchair for 5120 likes. Other way : if you couldn’t go to one of the establishments, you were invited to like pics of the item(s) you desired and join the random draw too. I chose this campaign because it is a perfect way to engage your audience. Of course, you need a budget but the concept isn’t too easy and not too hard either. People can easily access to the game. They begin to estimate the brand for its good taste in the decoration area and start to create an emotional link with the brand. Because I can’t let you with only one example, I give you some links to know more about Ikea Instagram website, the must-see account of the Iceland Police, how La Croix Rouge (French humanitarian association) makes you save life by double click on photos, and to finish, the action of Burger King for its arrival on the platform. This coffee shop brand decided to put Pinterest in real life by building a board in a shopping mall. This digital wall (screen) displayed the best pictures published on Twitter and Instagram using the hashtag #CaribouInspires. Naturally, as it was displayed in a shopping mall, the commercial side wasn’t too far. 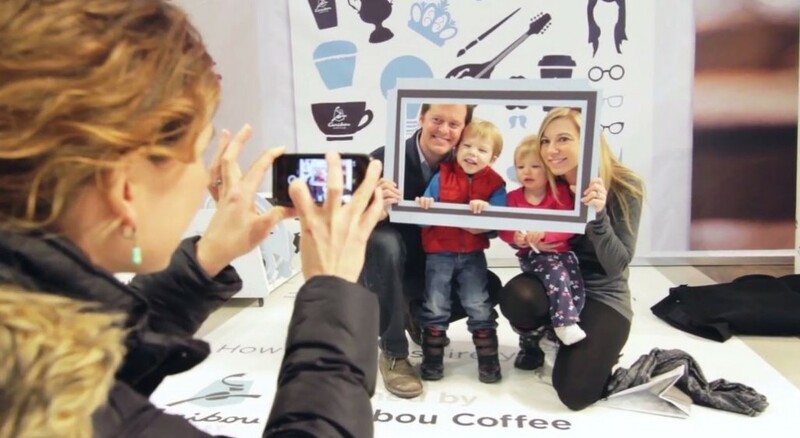 Some stands allowed people to taste the brand’s coffee and take photos with « frames » taken from the pinterest wall. Please, have a look at the article on best practices on Pinterest and mostly to the actions of Kotex and Peugeot. The first one sent personalised packaged to influencers based on their boards and pictures shared. The other created a real puzzle on its pinterest wall. Publié dans Analyse stratégique, English Time, Social Media, Tendances de Consommation, Trend AstucesÉtiqueté brand content, campaing, créatif, engagement, expérientiel, image, implication, instagram, marketing, photo, pics, picture, pinterest, réseaux sociaux, social media, solution, stratégie, univers de marqueMettre en favoris le permalien.